Sorry to hear the eagle died, but at least in died in caring hands.... we wish we could save them all but alas that can not be. Thank you Booni for doing what you could! You are amazing and so very dedicated to help these critters in trouble. So, Reg called yesterday to fill me in about the rescued Eagle. It is unknown how that Eagle got to be so skinny. They used the latest protocols for him, but it was too late. i got a call this morning about fledgling Crows, very young, down on the ground at Grassy Point. i suggested he call MARS. They would know what is normal for this time of year. i also suggested he take some fotos to show them. He reported back that all is good & in good order, according to MARS. Two days ago i ran into one of the managers of the Herons Rocks Campsite. She told me a family had discovered a Seal pup on Toby Island & what did i think? i told her to get the family to take a foto of the pup & send it to the Saltspring Natural Care Center & that likely the pup needed rescue. It had been a very hot sunny day & i was concerned that the pup be picked up as soon as possible. Well i heard back from the manager the next day, yesterday, that two families had been involved, the pup had been rescued & Norm was coming to Grassy Point in his helicopter to pick him up! While walking at Tribune Bay i had seen the tiny helicopter & tried to get a foto of him zipping by, unsuccessfully. While hearing this story, another call kept trying to come in. When i hung up a woman was leaving a message about a Seal pup. i cut in & said hello, & was talking to her, assuming she was one of the Toby Island rescue people but she was talking about ANOTHER Seal pup! This one close to me, in the Niner territory, at the base of the stairs. Marielle made sure i went down there with a tub & towels to do the capture, even though the woman was a Nurse & seemed game to take on the capture herself. i just say yes, ma*am & hop to it. Two Nurses were waiting for me when i got there & were very happy that i*d brought a tub & towels as they hadn*t managed to find anything suitable. They took me down to the beach at almost high tide line & it was hard for me to spot the pup til we were right on top of him or her! At first the pup was just flat out, melted into the rocks, & i thought, oh, no, this doesn*t look good. i also could see the telltale signs of dehydration & starvation, the noticeable shape of the skull, the wrinkled up skin, the hips sticking out. A healthy fed tended pup should be obscenely fat from head to tail. i was glad to see the pup lift their head & look at us! i was going to take an assessment foto, but decided it would be better to be sure to have the pup in hand first, even though the water was still far away. i popped a small towel over the head & picked him up under his flippers & he started crying & wiggling as i popped him into the tub & removed the towel. i could hear the pleasure & relief in Marielle*s voice when i told her we had the little one. From the foto sent, she knew this pup needed rescue, she even believed, going by the colour, that this one was a premature birth. i had lifted the tail & looked for the umbilical cord, but never saw one. This little one had a good weight & was definitely looking up at us & watching. But he was missing the wet rings around the eyes. Fortunately it had been a cool windy day, not like the previous day, but likely this poor little one had been lying there starving & dehydrating since birth, so it was very lucky that these women had spotted him & being Nurses they just knew something wasn*t right! We carried the tub back up the bank to the land while Marielle arranged for Jim Funk*s Water Taxi to be down at Ford Cove Marina waiting for me. Marielle had me feel the back flippers of the little pup. She said the temperature of them should be the same as my hand. Well, to me, they seemed warmer, so she had me pour some fresh cold water over the two back flippers so that the pup didn*t overheat on the trip in. i had never been asked to do this before. The little fellas was NOT impressed when i poured the cold water over. But obviously overheating was a big concern for Marielle. We transferred the tub to Jim*s boat & he was off to Deep Bay, a fifteen minute trip, he said, to meet a volunteer who was driving up from Nanaimo to meet him! That man would get the pup down to the ferry at Saltspring & likely another volunteer would be there waiting to take the pup to the center. The other pup was already there & in care. i had hoped we might catch Norm with two pups at once, but no such luck. You are in EXCELLENT care now & will be released when you are nice & fat & ready with other pups that you have been cared for with! i have a small foot/sandal, just to give some comparison of how tiny this one is. 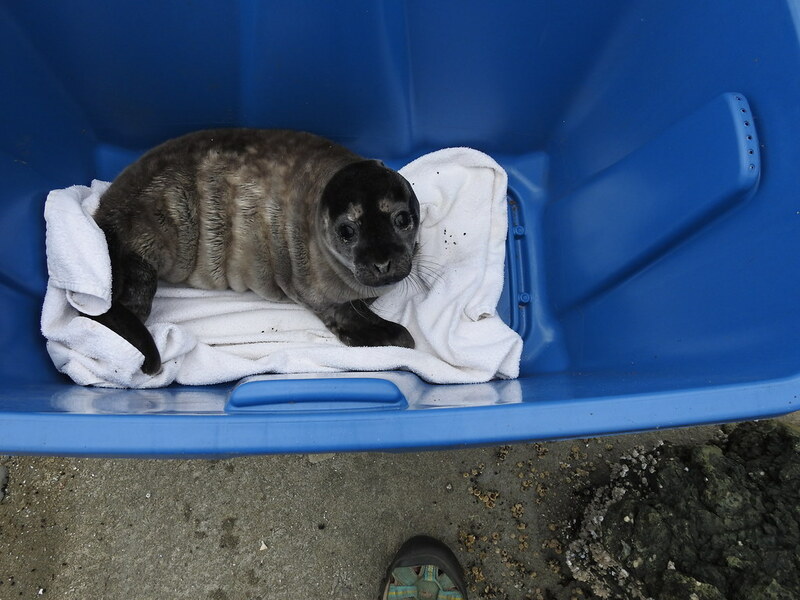 I'm glad the two baby seals were found and that you were able to make arrangements for them to be taken to rehab. H.E.A.R.T is special, booni, thanks to you and the others who help. When we heard a helicopter yesterday, I wondered if that was Norm?! Nice to know that he still is taking the birds, seals and other wildlife to the places where they can get the care they need. It takes more than a village to rescue those in urgent need. Thank you all involved.... good luck little ones, I know your in good hands now. One of the rescuers called Saltspring to see how our pup was doing! Turns out the Seal pup is female! Was premature, born maybe 7-10 days before she was finally found. She still had the umbilical cord, though i peeked & didn*t see it. You can tell that in the foto because they usually have wet rings around their eyes when they are hydrated properly. She is needing tube feeds at this point, til she can handle Fish. sunday morning Reg called me from MARS. A *Kestrel* had been spotted down at Grassy Point. He was quite excited, as there had only been one Kestrel at MARS so far. i suggested this was probably a Merlin, i don*t think we have Kestrels here? & i told him about the Nest & pair that we hear & see on the webcam. i called the man who had spotted the Bird. He was walking with his dog & spotted the Bird perched on fence post. The Bird didn*t move when his dog approached, & he thought there was something wrong with one of the wings. i asked if he could show me the Bird but he was leaving & couldn*t come. So i gathered a cat kennel, a towel to line it with & another to cover it, & a light net. i looked up down & sideways in the area he described to me, which was very clear, & asked everyone i saw, but could not find the Merlin anywhere. i returned a bit later & searched again, but no luck. When i reported this to Reg, he suggested to keep checking. Next day, last evening, i was just eating my dinner here when i heard someone calling my name from my driveway. My friend was coming home from swimming & she had passed a family on the side of the road all gathered around a small Bird that seemed unwell, & wondering what to do. So she came & got me. We went back down there together & sure enough there was a woman & her three young daughters, all wrapped in swim towels, down on the ground gathered around a beautiful Merlin who was just standing there. i*m thinking this is one of the fledglings from the pair we see & hear on the webcam all the time chasing Dad & Em. They said the youngster had been nodding off while they watched, the poor thing. i had them all help me herd the Merlin with their towels to keep the little one from getting away onto the road. Well, the little Merlin headed right into the bush, which was what i wanted, to get them up against the bush where they couldn*t get away. But the Merlin was so small, she just darted into the bush & under & was running away so fast! i had no idea they could run so fast, or that they would head under the bushes. So, the chase was on. The Merlin knew she was safer in the brush, & we were all having a hard time keeping up with how fast she could run. At one point we had her up against a wire fence with small squares, but she squeezed through one of the squares! So i went all the way around & through the bush back towards the fence. The Merlin was perched off the ground on a branch. i told my friend to just throw her towel over top but the Merlin darted away again & back towards the fence & started to squeeze through again! i went after her with my little towel & was finally able to catch her as she was trying to squeeze through to the other side. 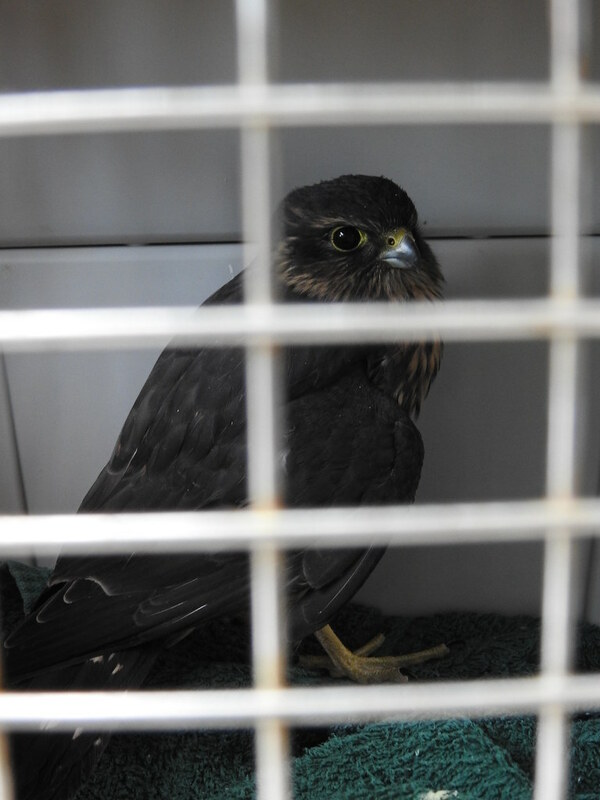 Everyone was greatly relieved to see the Merlin in hand. She spent the night resting in the covered kennel & i advertised on the Hornby facebook page for a ride in to town. Our Fire Chief was taking one of the trucks in for service & he would take the Merlin right in to MARS after he dropped the truck off! i met him at the old Fire Hall this morning & he seat belted the kennel into the passenger seat of the truck & softly closed the door. He was heading off on the first ferry & will be on the boat, hopefully if the lineup isn*t too long, as i type. i*ll call MARS when they open & give them the heads up that the Merlin is coming, also i will call Reg. He will be pleased that we found the Merlin after all. i hope you will be released back with your family soon. 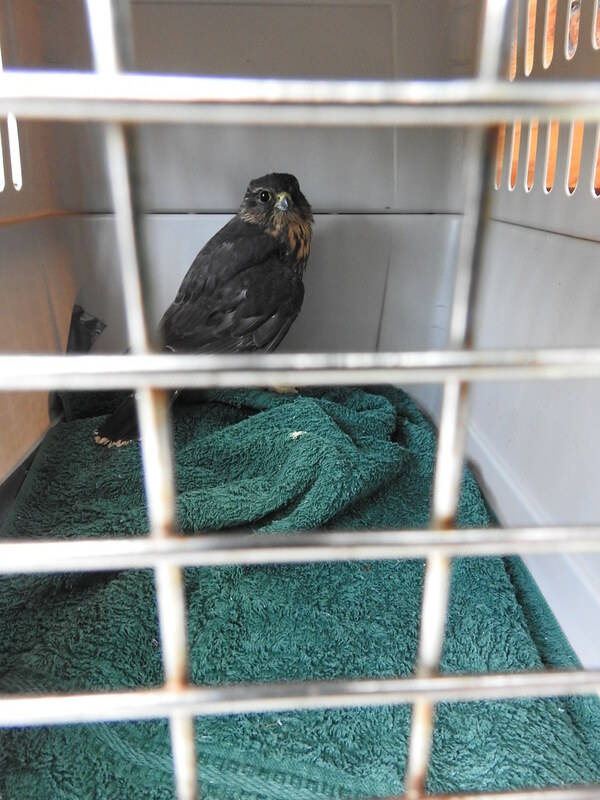 A report from our Fire Chief about what they said about the Merlin we rescued last evening. They say he/she has a broken radius or ulna in right wing with some pretty serious bruising. He didn't think the injury was in the joint which is great news. The bird also has a parasite that they commonly catch from eating pigeons and some other kind of black fly that lives in their feathers. All in all he seems kind of sick but will probably get better with some medicine, a pin in his wing bone, and some TLC. 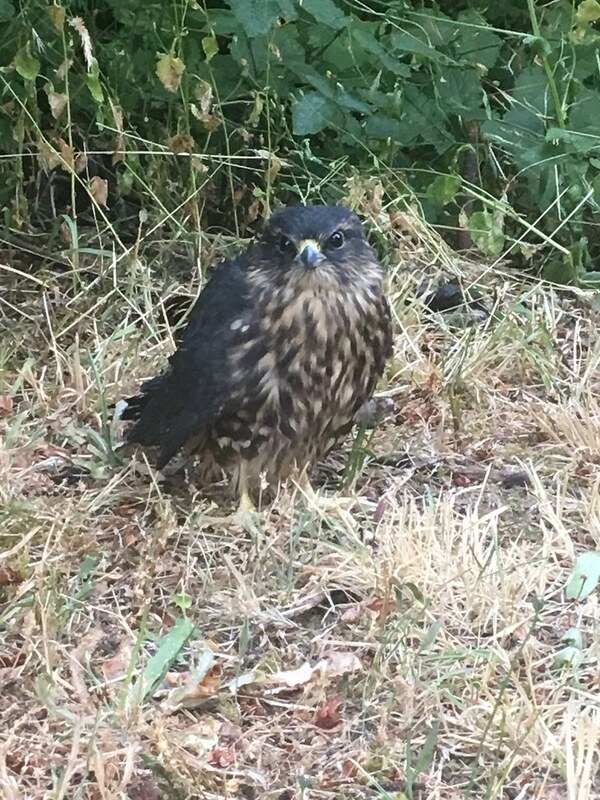 & here is a foto from last evening that the family took of the Merlin on the side of the road. What a cutie, sure hope he does well and can be released soon as he is better!! Thanks to all involved and of course a huge thanks to Booni.... I love HEART... great work!! !